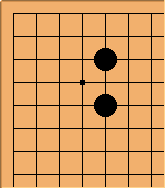 A corner enclosure, or just enclosure is created in a corner where one player has made two moves in the same corner, thereby enclosing the corner. The most common of these, the small low enclosure, is shown in the first diagram. When a reference to a shimari or enclosure is made without further specification, this is generally the enclosure meant. It has been difficult to standardise terminology here on SL. 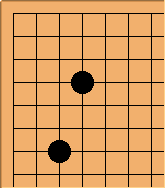 Many players prefer to say shimari, and use the associated Japanese terms like keima, ogeima, etc. 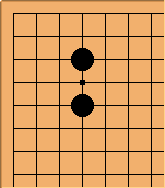 The page titles of the enclosure pages are consistently named by the coordinates of the stones, like 3-4 5-3 enclosure, but you may also find the same enclosure referred to by other names, such as small low enclosure, small knight's enclosure, the Japanese kogeima-jimari or even the mixed language small low shimari. See enclosure nomenclature and enclosure notation for detailed discussion. Most enclosures have the purpose of making territory. 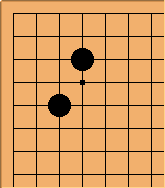 To be effective, enclosure stones should be close enough to each other so that they cannot be split, yet far enough from each other to avoid overconcentration. 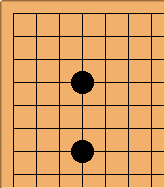 Because of this, most enclosures are built with four types of moves, the small knight's move, one point jump, large knight's move and two point jump. 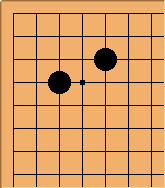 Of these, the knight's moves are generally more common than the jumps, and the closer moves are more common than the further moves. The most common enclosures are those based on the 3-4 point. 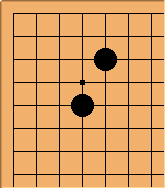 This is because the 3-4 point is a very popular first move in the corner, and because a 3-4 point makes for an unbalanced corner, where having the next move is quite effective. Symmetrical moves, like the 4-4 point and 3-3 point are not unbalanced, focusing instead on speed of development. 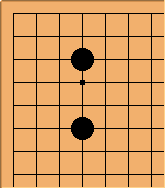 The page at enclosure joseki is a reference for variations in enclosure positions. The fundamental ideas are those of invasion, reduction, probe and aji. 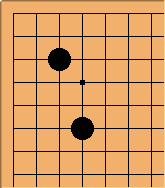 Some of the depth of the game of go shows in the way each enclosure has its own definite character, when discussed in terms of those concepts. These are the four common enclosures from a 3-4 stone, in order of occurrence in professional play. The first three especially are popular, and are found in many thousands of professional games. 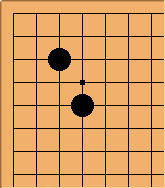 From a 3-4 stone, it is normal to enclose on the open side. 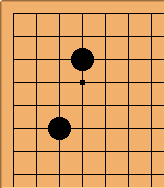 Enclosures on the other side are rare, and are usually only played when there is already a friendly stone reasonably nearby along the open side, such as in the Chinese fuseki. These are the four common enclosures from a 4-4 stone, in order of occurrence in professional play. 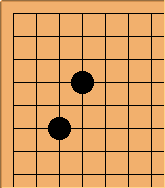 The first two, with a low extension from the 4-4 stone, are by far the most popular of the four, as they generally provide good balance between influence and territory. The high extension enclosures provide a lot of influence, but it is hard to make territory with them. Since the 3-3 stone makes for a very stable, balanced corner, it is not urgent to build an enclosure with it. 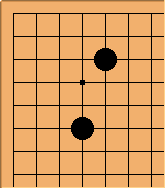 If players do build an enclosure, they will normally use a knight's move or large knight's move to do so, balancing territory and influence. From 3-5, by far the most usual enclosure is the one with 4-3, which results in the 3-4 5-3 enclosure already listed above. 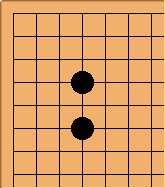 Other enclosures from this stone necessarily result in positions that aim mainly at influence. The three most common of these, in order of occurrence in professional play, are shown. Other enclosures are possible, but very rare. They usually indicate a special plan. See unusual enclosures for more details. It is dubious to call several of these enclosures though. Particularly the very large knight's move enclosures have the stones so far apart that they can often still be split. From the above statistics we can say that there are five standard enclosures (those with thousands of hits), and seven or eight semi-standard enclosures (those with hundreds of hits). Other moves are at best "special circumstance" or "experimental" enclosures.